Obamacare-removed 01.15.15 - Oddo Brothers CPAs - since 1979! Need some help with the directions? Not being prepared could result in BIG penalties OR lost tax credits. Our goal is to assist you in understanding what you need to do and when you need to do it. If you don't see your questions answered here, please email us and we will try our best to provide you with answers. Additionally, if you find broken links or want to recommend a link, please contact us. NOT currently a client of ours? Welcome to our website. We'd like to discuss providing you with our tax and accounting services. You can contact us by clicking here. Please feel free to share this link with your friends. Bottom line - EVERYONE is required to have insurance. How much it costs you is a variable. No need to continue if you are a working employee and have insurance. However - make sure your dependents have coverage. No need to continue if you are retired and have insurance such as Medicare. Yes, continue with this page if you are self-employed with no insurance. Yes, continue with this page if you have a business with employees with or without insurance. A - The # of employees important (you many need to provide insurance). B - You may have tax credits to claim if you already provide insurance. Yes, if you have insurance but want to compare costs using the online calculators. You can use the following online calculators to get an estimate of what your insurance will cost you. If you already have insurance, you may want to use the calculators to compare costs. Please remember, "household income" is still a gray area. In general, as of now, it is your AGI (adjusted gross income) from your tax return and the AGI from your dependent's return. We recommend you use more than one calculator as the results could be different. June 2012 - The bill doesn't mention the word "tax." The Supreme Court concluded "if" it did mention the word "tax" then it would be legal under the current constitutional taxing system. The original bill was 2,500 pages. Bureaucrats have already added another 17,500 pages of regulations. The legislation is now about 20,000 pages!! Our PAID elected leaders admitted that they did not read OR understand the bill they passed. They did recently read the part of the bill that said they too would be covered by the law just like you. Don't worry, apparently they are in the process of making that optional for them. Others say that isn't so. Stay tuned. In order to better help explain how this all affects you, we are eliminating about 19,997 of the above pages and presenting on this page only the content that we believe will be useful to you at this time. #2 - Info-graphic explaining the "overall"
Q: Any suggestions for minimizing the financial impact? It will take BOTH individuals and businesses time to comply - budget your time! Keep your workforce under 49 employees. ...Use part-time labor (but you still need to crunch the numbers). ...Use independent 1099 contractors. But again, make sure you properly classify them!! Charge employees the maximum allowed premium of 9.5% of household income. Pay the fine for low paid workers, pay the insurance on high paid workers. Renew your insurance in 2013. This may avoid premium increases in 2014. Remember to claim your potential tax credit if under 25 employees. Important: From 2014 on, the credit is available only available if insurance purchased through the exchange. Amend prior year returns if you qualified but for the credit but failed to claim it. Tax and insurance planning is more important than ever with the passage of Obamacare (taxes are increasing for certain incomes). ...Contact us BEFORE initiating any major activity such as selling assets. ...Contact your insurance agent to review your plan options in conjunction with Obamacare. Q: What are the important deadlines that apply to my small business? Know where you stand on the # of employees to determine your requirements. If you are currently offering insurance to your employees, discuss it with your insurance agent and make sure it meets the requirements of Obamacare. If you have at least 1 employee and sales of $500,000 or more, notify employees in writing of "exchanges." If you already offer insurance, here is a sample letter (3 pages long). If you do NOT offer insurance, here is a sample letter (2 pages long). And there might be a penalty for not notifying the employee(s). Update - the penalty will not be applied. Exchange opens - you can start shopping for insurance. Don't forget to vote! For the numbers of days until then, click here. If 50 or more employees - the employer "mandate" of providing insurance begins. Possible penalties for not providing insurance. As always, look for our emails. Anytime you receive an email from us it is important. Important: The penalty applies to the taxpayer AND up to 2 additional dependents. Consider buying the insurance but decide when is the best time to do that based on your income and other factors such as age. Make sure your insurance policy adheres to the new Obamacare requirements. Contact us BEFORE initiating any major activity such as selling assets. Tax planning is more important than ever with the passage of Obamacare (taxes are increasing for certain incomes). Q: What are the important deadlines that apply to me? 10/01/2013 - If you have no insurance, start "shopping" on the exchange that opens up online. Or get with an insurance agent or your parents if under 26. 01/01/2014 - If you don't have insurance soon, you face a penalty - keep shopping!! 03/14/2014 - Deadline for securing insurance ends - penalties kick in. 11/04/2014 - Don't forget to vote! For the numbers of days until then, click here. Choose the info-graphic below that pertains to your situation and get familiar with the overall explanation. There are two main approaches to Obamacare - employEE or employER. Each info-graphic will open up in another window where you can re-size or zoom in to better read it. This is of course best done with a large desktop monitor and not with a cell phone. Q: Does the insurance have to provide specific minimum coverage? YES. Contact your insurance provider and verify it meets the "required essentials." Q: Does the insurance have to cover the employee's spouse and children? NO. The ACA law does not require this. However, one source seems to think it does have to cover children but there is an issue regarding the spouse. 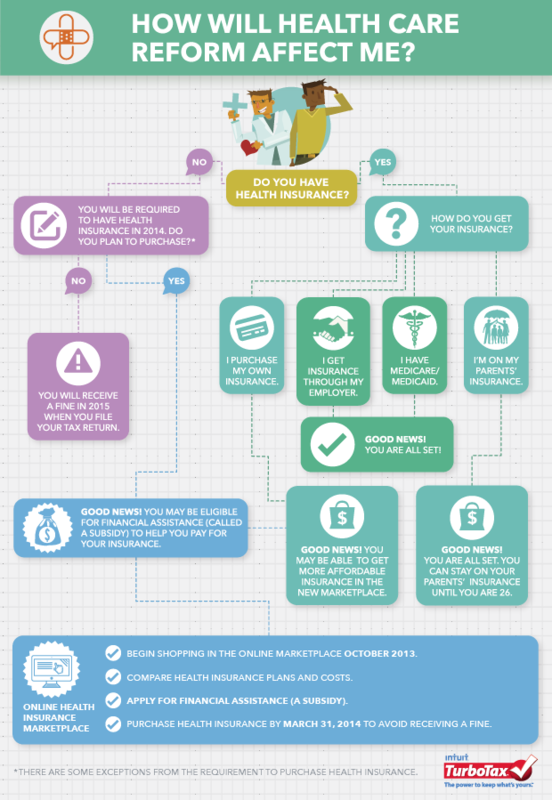 Q: Can I "enroll/shop/buy" on the new insurance exchange? YES. If your business has less than 100 employees you use the SHOP portion of the exchange. Q: I just love consuming my free time with calculations, will I enjoy the new health care law? YES!!! And the next few questions will explain why you will have tons of fun and why you won't have to spend as much time at the recreation center or with your family. Q: Does the number of employees matter and why? YES. When it comes to counting your employees, you need to determine how many full-time employees you have. Please refer to the info-graphic above for businesses. Once you determine the # of employees, you will know whether or not you MUST provide insurance and IF you are eligible for tax credits. Q: Is there a specific time frame for counting employees? YES. You do the calculations for EACH month of the PRIOR CALENDAR year. January - December. 12 calculations that you add up and divide by 12 for the average monthly # of employees. You can also choose other periods of the prior year- no less than 3 months - no more than 12 months.You also have a 3 month administrative period. Q: And I do something with the calculation results of full-time employees? YES. First you double check them. And after that we are not even going to try and explain. The next best thing will be for you to read this example even though there appears to be a typo with the dates it gives you an idea of what you'll be doing. What we haven't seen addressed is what happens as employees come and go. An employee could get fired right before 2014 in the example, and then what? Do you still provide the insurance? It appears "they must be offered coverage during a subsequent “stability period” that must be as long as the look-back period and can’t be shorter than six months." Q: Can I start another company to employ employees "#50 and above"? YES but. But the "aggregation rule" kicks in. Since you control both companies you do the calculation as if it was one company. In other words, it would be a waste of your time to start another company in an attempt to circumvent the rules. Q: Do seasonal employees count? NO. You exclude them from the calculations. Q: Do part time employees working less than 30 hours per week count? NO and YES. You exclude them if they meet certain criteria. But they might count so be very careful!!! Stay tuned for further clarification. Q: Do I count myself when counting employees? NO. Do not include sole proprietors, partners, and "greater than 2%" S-corporation shareholders. Q: Do I count leased employees when counting employees? NO. Do not include leased employees. At this point, be thinking about "running numbers" if you get close to 24 employees. Leasing employee #25 and above might keep you in the "tax credit" category. If you are already over 24 employees, using leased employees might keep you under the magic 50 number. Q: Do I count INDEPENDENT CONTRACTORS (the 1099 workers) when counting employees? NO. Do not include independent contractors. Q: Is classifying workers properly still important? You will continue to receive emails from us regarding this. If you classify a worker incorrectly as 1099, in addition to the regular pain and suffering of the usual penalties, you may end up in a completely new category for the # of employees for Obamacare and that could spell $$$$ such as paying back tax credits and "lack of insurance" penalties. Q: Do I pay any penalties for ignoring the law? YES. There are 2 penalties that can be triggered. One for not providing insurance and one for not providing "affordable" insurance. However, the penalties have been postponed until 2015. That gives you 2014 to start getting your procedures in order. Q: What's all this going to cost my business? DEPENDS but probably a LOT. There are many variables to this answer. Just assume you better start budgeting accordingly. Which means you need to start planning NOW. If nothing else, you'll have to invest your time. Q: Can I have the employee pay anything for the insurance? YES. But any premiums the employee pays cannot exceed 9.5% of the employees household income. Q: After the bureaucrats figured out the above is easier said than done, did they come up with a fix? YES . There are 3 alternatives to meet the 9.5% household goal of being "affordable". Essentially, you use box 1 of the W2 form (even though that still probably doesn't arrive at the actual amount). Q: I use QuickBooks and their payroll feature, will it do the employee calculations? Unknown at this time. However, we called Intuit (publisher of QBs) and they said they will address the issue. Q: Any changes required in W2 reporting? NO. Unless you have 250 or more W2 forms to issue. Q: I use an outside payroll service, will they assist with employee calculations? Unknown at this time. It appears they are taking a wait and see approach right now. Q: I love increased small business burdens, is there any additional legislation I can look forward to? YES . Check this one out! Increased sales tax collection responsibilities!!! Q: I am both an employee and employer, what do I do? If you work for one company but have a business on the side, then you need to study BOTH info-graphics above. If you work for your own company, same answer. Q: If I already have insurance, do I need to do anything else? NO (in general). See the info-graphic above for employees. However, it would be a good idea to contact your provider to make sure it meets the "required essentials" of the new law. You may also want to "shop" to compare pricing. Q: If I am covered under Medicare, do I need to buy additional insurance? NO. Any decent insurance qualifies. Q: If I do NOT have insurance, will I be required to have it? YES. See the info-graphic above for employees. UNLESS you meet one of the exceptions. 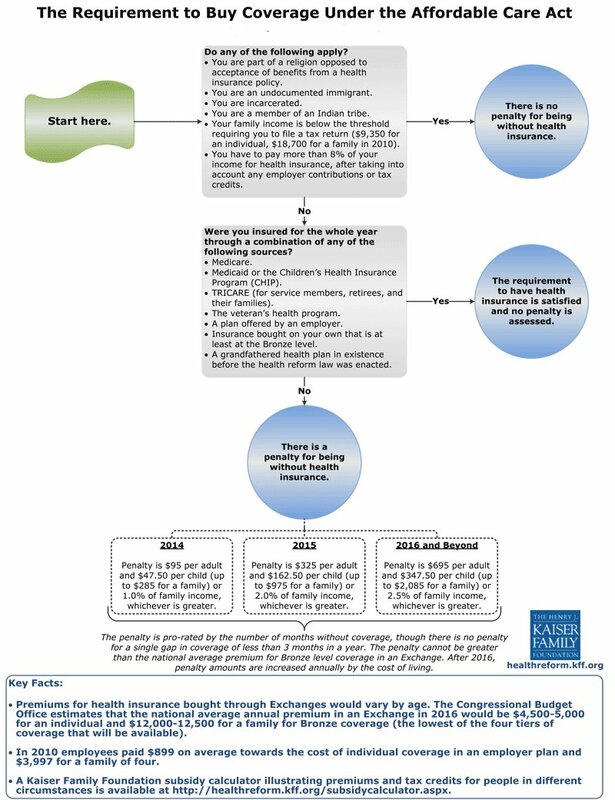 Q: What is the process of using the "Health Insurance Exchange" website? Starting 10/01/2013, you A-apply/enroll, B-shop, C-buy. Q: What does the application look like? Yes. If you are in Georgia, check this out. Q: What is the deadline for buying insurance? You need to be covered by 03/31/2014. You can start "shopping" 10/01/2013. YES. They start out small but increase over the next few years. Q: How will the government determine my subsidies if any? By using a combination of your 2012 income tax return, information your insurance company will report to the government, and best guesstimates if you haven't filed a return. Q: What happens if you guess wrong and the subsidy was too much? The IRS will "recover" it from you in subsequent years. It's more of an "advance" credit - so you need to guess accurately! Q: What's all this going to cost me? DEPENDS but probably a LOT. There are many variables to this answer. Just assume you better start budgeting accordingly. Which means you need to start planning NOW. Both time and money. One factor is your household income. Q: Does household income include that of my significant other even if I'm not married? Unfortunately, we don't have a definitive answer on this. we will update this as more information is known. The answer could raise or lower your income number to the point of affecting your responsibilities one way or the other. When it comes to an offer-in-compromise - according to the IRS............."You will also need to gather information about your average gross monthly household income and expenses. The entire household includes spouse, significant other, children, and others that reside in the household." But when dealing with the ACA - it just seems to include the income of your dependents. Then again, it might include EVERYONE in the household which of course makes more sense. Q: Do I pay more if I smoke? YES. Depending on the state you live in and what "fixes" happen to the legislation. Understand there is a very good chance this will change. The extent is unknown at this point. June 2012 - The bill doesn't mention the word "tax" but the Supreme Court concluded if it did, it would be legal under the current taxing system which is constitutional. The President said it was NOT a tax and argued to the Supreme court it was legal under the "Commerce clause." But the Supreme Court said that argument would not be legal. So the Court took it upon themselves to call the President's penalty/mandate a tax to make it legal. Problem solved. The President still maintains it is not a tax. But others say that according to the Constitution, TAX LAWS need to originate from the HOUSE but this law originated from the Senate. There are still many active and open challenges to the law that are making their way through the courts. And even without court action, the President has been making changes on his own so expect more changes from that aspect alone. So what do you do? Wait to see or move forward? You don't want to get caught behind your competition and you don't want to over invest. So pay attention to this issue as it progresses. The bottom line is the Supreme Court says it is legal. Thus, we are going to continue to inform all of our clients on matters that affect their tax situation. Contact us with your questions, comments, or suggestions. We can then reply to you and/or update this page accordingly. Additionally, as mentioned above, there will be changes to the law and this page. As major changes occur, our plan is to contact you. Info-graphic for penalties for individuals. Info-graphic for penalties for businesses. Health Insurance credit for businesses in clear chart form. A lot happens after you enroll. 21 tax increases? or not really 21? After extensive research, this page is simply an accumulation of what we feel are the important questions and answers that pertain to most small businesses and individuals. We included links where appropriate to support the answers. The links are to sites that deserve a LOT of credit for researching the new law. We've left a lot out of small print, detail, and examples as that often just distracts from the overall important concepts. What we can TRY to do is to discuss tax planning, calculating the number of employees, tax credits, or tax penalties. Even then, you will be ultimately responsible for any decisions made. We take no responsibility. ALL of us are in a learning phase at this time. Please remember, if you come to us after the fact, all we can do is let you know how it WILL affect your tax situation. If you come to us before you take action, we might be able to suggest something to minimize the tax consequences. Send notice to employee annually. Send notice to employees by 10/01/2013 because employees need the info when on the exchange. Premium tax credit available only for purchasing on the exchange for individuals. Premium is calculated on the exchange website. SB tax credit only available if insurance purchased through exchange. Amend prior business returns if credit applied but wasn't claimed. DOL will not enforce penalty on employers for not issuing the notice to employees by 10/01/13. 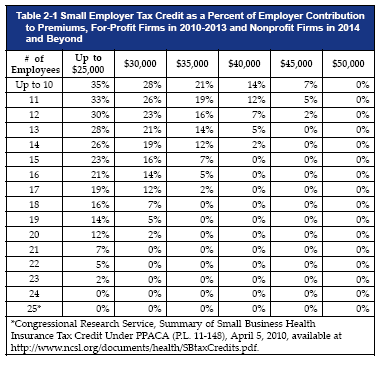 09/16/13 - Employees can pay more of premium if under 50 employees. 09/24/13 - Added Intuit's online calculator link.